If there is magic on this planet, it is contained in water – (Loren Eiseley, “Four Quartets,” in The Immense Journey). The real magic of Florida in not found in the Disney kingdom, but rather in the tremendous abundance of freshwater spilling forth from her hundreds of springs, thousands of rivers, streams and lakes, and millions of acres of wetlands and underlying aquifer. 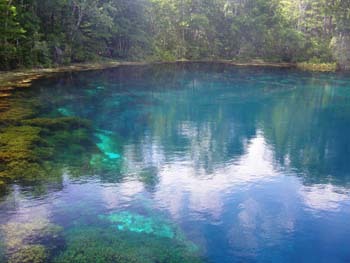 Water is perhaps Florida’s most valued resource. Wakulla County is likewise blessed with more than her fair share of this watery wealth. The handsome crown she proudly wears is inlaid with the dazzling jewel that is Wakulla Springs, the World’s deepest and longest freshwater spring. Below her crown etching distinct lines of fine character into her ageless face are the four major rivers we know as the Ochlockonee, the Sopchoppy, the Wakulla and the St. Marks. These four rivers each with their own unique personalities stream toward Apalachee Bay and the larger body of the Gulf adding to the rich complexion of Wakulla County. Rivers captivate with timeless reverence. They are generous and wise. A river seems a magic thing. A magic, moving, living part of the very earth itself. – (Laura Gilpin, The Rio Grande). Rivers provide natural protective barriers and form political boundaries. They provide a means for travel and transport of goods. They serve as a source of irrigation and renewable energy. They are part of ecosystems that supply us with food and provide habitats for wildlife. Rivers are the life blood that gives rise to villages and outposts, and birth communities and towns. The rivers of Wakulla played a significant role in the molding of Wakulla County as we know it today. Prior to European settlement that began with the arrival of Spanish conquistadors; the native Apalache once ruled this region, their grand nation defined by river boundaries that extended from the Ochlockonee to the Aucilla. Even earlier along the prehistoric banks of the Wakulla River roamed great mastodons and saber-tooth tigers. Much later in history, the St. Marks River would provide the waterway for cotton transport from Tallahassee to the coast and prompt the eventual founding of this area as Wakulla County. In the early days, the Sopchoppy River would also be significant to commerce providing for the operation of lumber mills and the construction of the railroad. Today the rivers of Wakulla draw visitors year-round and provide perfect places to pursue recreational boating and other water sports. Along the western edge of Wakulla County runs the Ochlockonee River which begins in Georgia 200 miles upstream. This river corridor is home to many threatened species of fish, wildlife and plants, such as the orange azalea, the wood stork and the Atlantic sturgeon. Along the river lives Florida black bear and in the brackish waters live blue crab, sea trout, redfish and largemouth bass. It is the deep yellow and reds of Georgia clay that colors the waters with rich organic matter that then flows downstream and feeds the healthy estuaries, vital to production of our renowned fresh seafood. By day the landings along the river keep busy as boats of all kinds come and go carrying passengers to fish, to ski, or simply to enjoy this very impressive river. The dark tannin waters of the nearby Sopchoppy River begins its 47-mile journey somewhere deep in the wetlands of the Apalachicola National Forest. The blackwater river passes through protected forests almost its entire length and eventually merges with the larger Ochlockonee. Boats of all types share the lower river, but the river narrows impassibly to motorboats further upstream. Those who push on in kayaks and canoes are richly rewarded with a true wilderness experience on this state designated canoe trail. Small trickling streams seep from the deep earthen banks of the Sopchoppy River as it winds underneath a dense canopy of trees. In the cool quietness of the wilderness, time is magically suspended and you can almost hear the cosmic breathing of the ancient past. There are many similarities between the Wakulla and St. Marks rivers which both feature an incredible wealth of wildlife – birds of prey, wading birds, alligators, turtles, manatees, otters, mullet, bass and bream. The crystalline waters of the 10 mile long Wakulla River rise from Wakulla Spring, one of the few exclusively spring-fed rivers in this part of Florida. While the St. Marks River originates in cypress swamps 35 miles to the north, once it reappears from its short underground journey at Natural Bridge, it too becomes fed by a first magnitude spring. The fellow rivers converge near their respective ends and flow together into the brackish waters of Apalachee Bay. These related rivers are highly revered by boaters and other outdoor enthusiasts who sometimes travel great distances to enjoy the natural beauty and rich history of these two remarkable waters. Cruising the four rivers of Wakulla are two Certified Green Guide boat captains who are eager to share with you the sights and sounds of the riverways. Captain James Hodges of St. Marks Charters and Capt. Joey Tillman of Wakulla Adventures specialize in scenic boat tours that will expose you to our finest in river wildlife and natural wonders, provide outstanding photo opportunities, and can even transport you back in time. Capt. James has been navigating the St. Marks and Wakulla Rivers for years. He especially enjoys taking passengers on historical trips to the lost town of Magnolia or on his interpretive San Marcos Coastal “Conquistador” tour. Capt. James also offers a “party boat” cruise that leaves the designated driving to him. His favorite though is the highly popular sunset cruise down the lower St. Marks River and out into Apalachee Bay for amazing views of the breathtaking sunset and magnificent St. Marks Lighthouse. Capt. Joey is a Master Captain who operates his 30 ft. solar/hybrid pontoon boat with partially covered comfortable seating (wheelchair accessible) that guarantees 360 degree views of the natural beauty. Capt. Joey knows how to cruise. He is a former yacht captain and Master Naturalist who also ran eco adventure charters in the Bahamas for private cruise lines. In addition to his scenic riverboat cruises offered on the various rivers, Capt. Joey also runs a snorkeling trip in the mysterious waters of the clear Wakulla River.